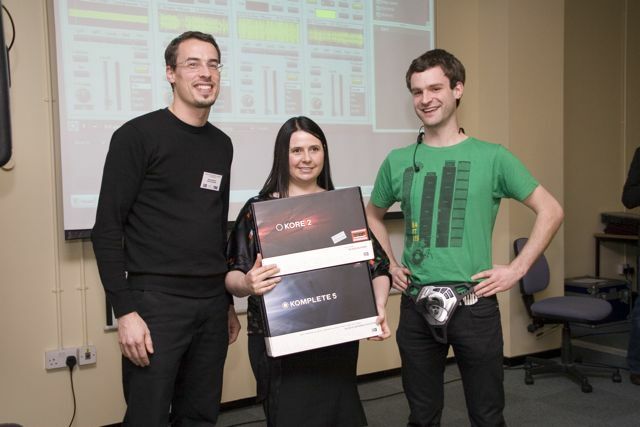 In 2007 I won the Native Instruments Sampling & Synthesis competition where I received an amazing prize from Native Instruments consisting of Komplete and Kore. The winning track is called Zeetar (click on blue title to listen) which was constructed from sampled and designed sounds including a drum kit which I designed from recordings of the sounds of different shoes. It also includes sampler instruments created from original recordings I did of the Oboe and my own voice. I recorded, produced and mixed the track in my home recording studio, and also at Ealing Film Studios. Here I am receiving my award from Electronic Composer Tim Exile (right) and Stephan Ruehl (left) from Native Instruments.